Phillips (knee) is active for Sunday's game against the Chargers, Darren Urban of AZCardinals.com reports. Analysis: Phillips returned to practice in a limited fashion late in the week, so he'll be good to go Sunday while providing Ricky Seals-Jones and Jermaine Gresham with depth at tight end. Phillips (knee) is listed as questionable for Sunday's game against the Chargers, Darren Urban of the Cardinals' official site reports. Analysis: Phillips was able to practice on a limited basis Thursday and Friday after having been sidelined to begin the week, and it remains to be seen whether he'll suit up during Sunday's game against the Chargers. The veteran tight end has not been targeted during two starts with the Cardinals, and he will serve as a rotational blocker and special teams player if he's able to play Week 12. Phillips (knee) was a limited participant in Thursday's practice, Darren Urban of the Cardinals' official site reports. Analysis: Phillips was upgraded to a limited practice after being sidelined to begin the week. The veteran tight end is still nursing a knee injury sustained during last week's loss to the Raiders, but he appears to be progressing well in his recovery. If Phillips is able to suit up against the Chargers on Sunday, he'll see usage as a rotational blocker and special teams player. Phillips (knee) did not practice Wednesday, Darren Urban of the Cardinals' official site reports. 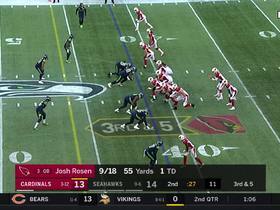 Analysis: Phillips appears to have sustained a knee injury during a Week 11 loss to the Raiders, putting his availability for Sunday's tilt against the Chargers in question. The veteran tight end has only seen usage as a rotational blocker during his two games with the Cardinals, so it's unlikely that his tentative absence would have a notable impact on Arizona's offense. Phillips signed a contract with the Cardinals on Tuesday, Darren Urban of the team's official site reports. 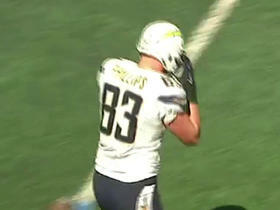 Analysis: Phillips will likely serve as a reserve tight end behind Ricky Seals-Jones and Jermaine Gresham. The 10-year pro has been utilized more as a blocker than a pass catcher in his career and has recorded only 390 yards and five touchdowns in 112 games played. Philips replaced fellow tight end Gabe Homes on Arizona's 53-man roster. 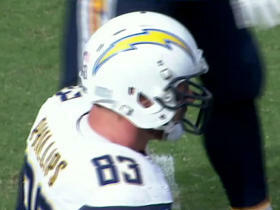 Phillips was cut by the Saints on Saturday, Joel A. Erickson of The New Orleans Advocate reports. Analysis: Phillips has been a career backup, recording just 390 yards and five touchdowns in 112 games played. He played one game with the Saints in 2017 and his release won't shake the offense up at all. He may look to sign on with another team in need of veteran tight end play. The Saints signed Phillips to a contract Wednesday, Herbie Teope of The New Orleans Times-Picayune reports. Analysis: The Saints have yet to announce a corresponding move to open up a roster spot for Phillips, but his addition could speak to some concern the team might have about the health of fellow tight ends Michael Hoomanawanui (concussion) and Garrett Griffin (undisclosed). Per Teope, Griffin was absent from the media-access portion of Wednesday's practice. Phillips previously appeared with one game for the Saints in Week 16 against the Falcons, logging only eight offensive snaps. Phillips was waived by the Saints on Friday, Herbie Teope of The Times-Picayune reports. Analysis: The Saints were looking to boost their offensive line depth ahead of Sunday's season finale against the Buccaneers, and Phillips was ultimately the odd man out. He was called up by the team prior to Week 16 due to multiple tight ends with injuries. He will presumably revert back to the Saints' practice squad assuming he clears waivers. Phillips signed a contract with the Saints on Tuesday, Josh Katzenstein of The Times-Picayune reports. 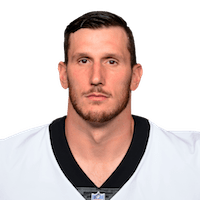 Analysis: Phillips was waived by the Saints before the beginning of the regular season with an injury settlement but now returns, giving the Saints much-needed depth at tight end. 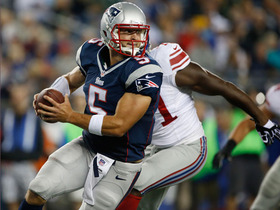 In order to make room for Phillips on the roster, linebacker A.J. Klein (groin) was placed on injured reserve. Look for Phillips to play a reserve role on offense behind the likes of Josh Hill, Michael Hoomanawanui and Garrett Griffin. 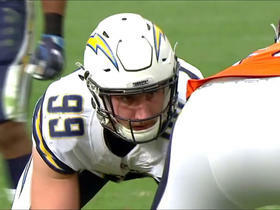 Already in the first half, the San Diego Chargers have hurried Denver Broncos quarterback Trevor Siemian 5 times with 3 knockdowns. 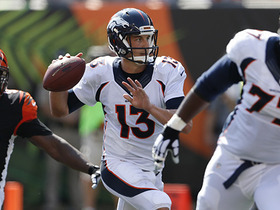 Denver Broncos quarterback Trevor Siemian finds tight end John Phillips in the middle of the end zone for 1-yard touchdown. Review the best of the 2013 preseason and find out if Tim Tebow's game-clinching touchdown pass or Ted Ginn's Week 3 punt-return TD slide into the No. 1 slot. 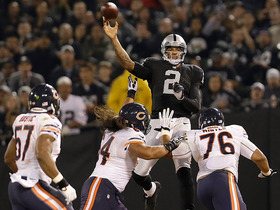 Now that Week 3 of the preseason is in the books, find out if Oakland Raiders QB Terrelle Pryor's off-the-back-foot pass lands in the top spot of the top 10 performances. 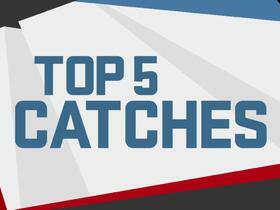 Carolina Panthers corner Josh Norman stretched out to make an acrobatic interception to help seal the victory against the New Orleans Saints, but was it good enough to be the week's top catch? Megatron makes an incredible grab down the sideline. 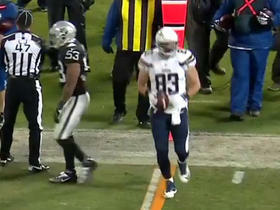 Find out who else made the Top 5 catches..
San Diego Chargers tight end John Phillips makes an incredible one handed catch for a 15 yard gain.